As one of the largest, most wide-ranging urban redevelopment programs in the United States, the Atlanta BeltLine is building a more socially and economically resilient Atlanta with our partner organizations and host communities through job creation, inclusive transportation systems, affordable housing, and public spaces for all. The Atlanta BeltLine is a sustainable redevelopment project that is transforming the city. It will ultimately connect 45 intown neighborhoods via a 22-mile loop of multi-use trails, modern streetcar, and parks – all based on railroad corridors that formerly encircled Atlanta. When completed, it will provide first and last mile connectivity for regional transportation initiatives and put Atlanta on a path to 21st century economic growth and sustainability. In order to support and fully realize the vision of 22 miles of a more connected Atlanta, the Atlanta BeltLine also supports affordable workforce housing, economic development, job creation, public health, streetscapes, public art, environmental clean-up, and historic preservation – all with an eye towards sustainability. 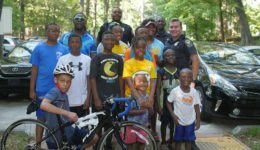 Two organizations – Atlanta BeltLine, Inc. and The Atlanta BeltLine Partnership – work together with countless partner organizations across the city, region, state, and country to bring the program to life. The beauty of the Atlanta BeltLine is that it offers not only modern conveyances and exciting new development, but it is a living, breathing part of our community; not simply a means of getting somewhere, but a destination unto itself. It offers a chance for Atlanta to redefine what it is to be a neighbor, to be a community, to be a region, and to share all that it has to offer. What is the Atlanta BeltLine? The Atlanta BeltLine is a planned loop of 22 miles of modern streetcar (an expansion of the Atlanta Streetcar), planned 33 miles of multi-use trail, and anticipated 2,000 acres of parks. It will open in phases through the anticipated completion in 2030. As of 2019, the Atlanta BeltLine consists of five open trails and seven parks. The trails welcome nearly 2 million visitors each year. Intensive planning for modern streetcar expansion is underway in conjunction with More MARTA. More than $4.1 billion has been generated in private economic redevelopment. Over 2,500 affordable workforce homes have been created or preserved within walking distance of the Atlanta BeltLine. Along the way, you’ll discover the largest temporary public art exhibition in the south, free fitness classes, a linear arboretum, and urban farm. First conceived as a 1999 master’s thesis by Georgia Tech student Ryan Gravel, the Atlanta BeltLine evolved from an idea, to a grassroots campaign of local citizens and civic leaders, into a robust new vision of an Atlanta dedicated to an integrated approach to transportation, land use, greenspace, and sustainable growth. Why is the Atlanta BeltLine Important to the Region? The Atlanta BeltLine represents a new framework for the region’s growth, centered on Transit Oriented Development, an unprecedented expansion of park land and public spaces, and vital expansion of the regional transit and transportation network via multi-use trails and modern streetcar. As a major new planned transportation corridor for both pedestrians and transit riders, the Atlanta BeltLine provides critical first and last mile connectivity with direct connections into downtown and midtown. With links to the existing MARTA system and other transit services from outlying suburban communities, the expansion of the Atlanta Streetcar system is a transit component critical for long-term transportation initiatives benefiting everyone in the entire metro Atlanta region and beyond. When Will the Atlanta BeltLine be Completed? Large parts of the Atlanta BeltLine are already here – with more to come! Five trail segments are open, seven spectacular new or renovated parks are open for public enjoyment, and new affordable housing is making it easier to live along the corridor. The Atlanta BeltLine Run.Walk.Go! Series and Art on the Atlanta BeltLine are can’t miss events, energizing and enlivening the community. Much work remains, however, and it will occur in phases through 2030. Exciting new things happen every day along the Atlanta BeltLine! How is the Atlanta BeltLine Being Developed? Atlanta BeltLine, Inc. (ABI) is managing the planning, design and implementation of all aspects of the project with partners in the public and private sectors. Approximately 3,000 acres of underutilized land along the corridor will become available for public and private redevelopment opportunities. Funding for the Atlanta BeltLine project comes from a combination of federal, state, local, and private sources. The Atlanta BeltLine Partnership enables the Atlanta BeltLine project by raising funds from the private sector and philanthropic community, engages the public through programming and outreach, and empowers the residents of the 45 Atlanta BeltLine neighborhoods through targeted partnerships in the areas of health, housing and economic opportunity. Who is Involved in the Atlanta BeltLine? You! First and foremost, the Atlanta BeltLine is a project by and for the people of Atlanta. Thousands of Atlantas have volunteered their time to help realize the Atlanta BeltLine vision. In addition, Atlanta BeltLine, Inc., the Atlanta BeltLine Partnership, and the City of Atlanta are all integral to the implementation of the project. Pictured: Atlanta BeltLine Project Overview Map.